Damon Fryer of Daily Driven Exotics brought his Lamborghini Huracan for his third wrap. That’s right! This is the third wrap going on the Huracan Damon dubs TIRE SLAYER. Again, the job goes to PFS to transform the DDE Huracan into a completely different car. This wrap had to one-up the two previous jobs by a factor of 3. The design was done by Skepple, like a lot of our recent wrap designs. 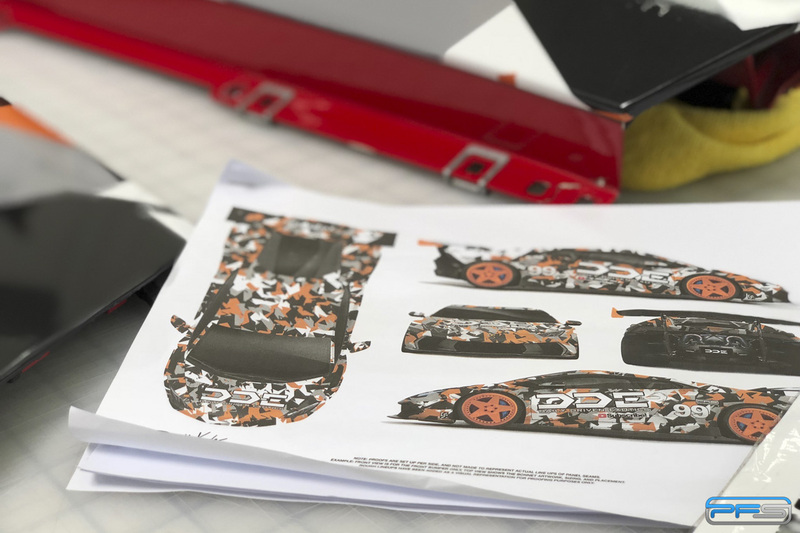 It’s Damon’s take on the orange camo used on the Lamborghini Aventador SVJ that broke, and still currently holds, the Nürburgring production car lap record. The car got a very bright orange set of SKOL Wheels by BRIXTON. 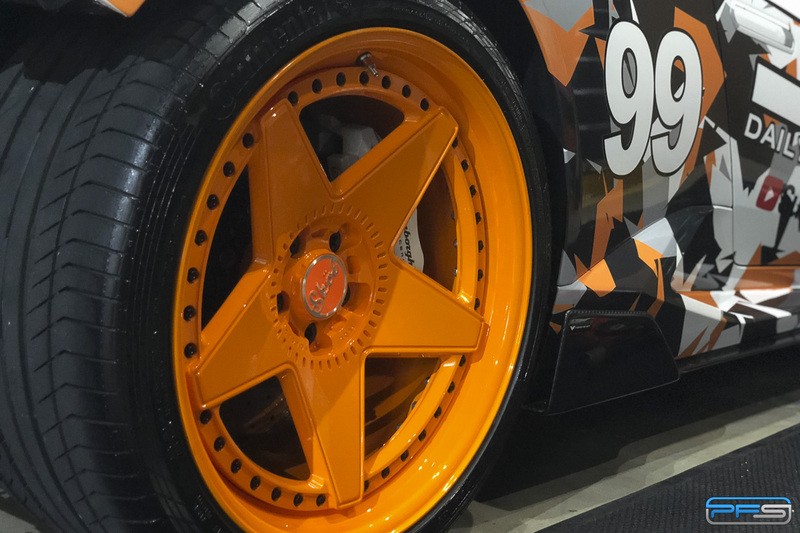 The wheels went on the car well before the orange camo SVJ wrap had even been put down on paper, or computer file for that matter. This threw a lot of channel viewers off. The previous wrap had a blue base tone. Because of that, the bright orange SKOL wheels where very off-putting to some viewers. Now that the wrap is complete, they make total sense and look amazing. 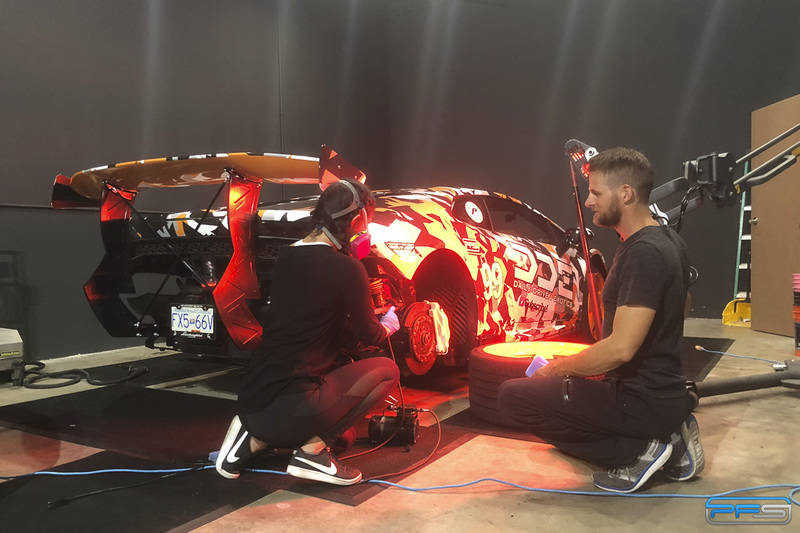 To make sure that factor of 3 was met, we went to the extent of wrapping the door jambs, the inside of the doors and even the panel above the instrument cluster. Red paint isn’t exactly the easiest base color to wrap. The bright color loves to poke its head at every available chance. Wrapping the door jambs and inner doors made it so we could minimize the amount of red that could show through. We’re happy to say that it’s nearly impossible to tell this car is red unless you look very, very closely and you know what you’re looking for. Of course, the project wouldn’t be complete without a full protective coating using our proprietary Glanz Ceramic Coating. The coating will help keep the wrap clean and protected from any staining. As Damon’s channel name suggests, this Lamborghini gets driven daily, so everything that can be done to keep it clean it key. 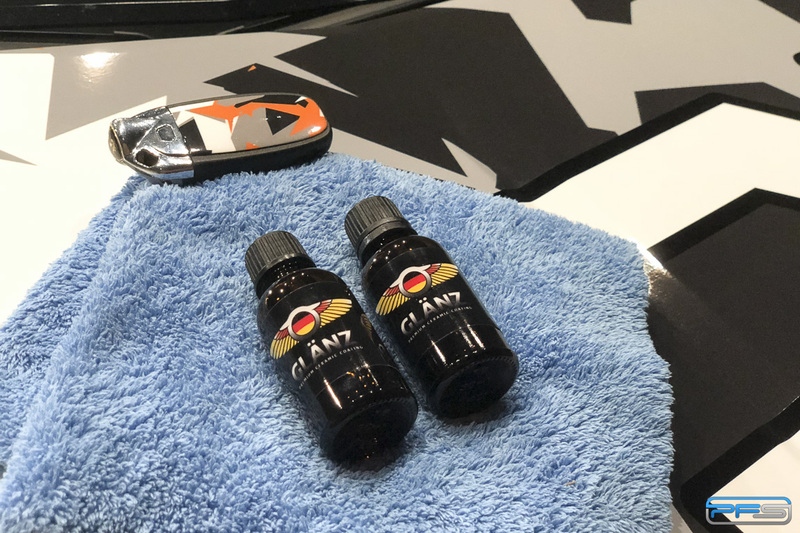 Check out this video of the installation of Glanz Premium Ceramic Coating on the Daily Driven Exotics Huracan after the wrap was complete.